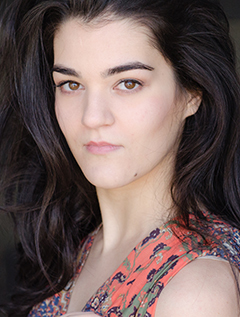 Lauren Ezzo is a Chicago-based audiobook narrator and commercial voice talent. A Michigan native and Hope College alumna, at this writing she has narrated over 100 titles for authors including Catherine Ryan Hyde, Georgia Clark, Adam Rapp, M. Dressler, Christopher Rice, Kirk Lynn, Lauren James, and Dot Hutchison. She has won multiple awards for her narration, including several "Best of the Year" lists, and several Earphones Awards. In 2016, her performance of The Light Fantastic, by Sarah Combs, conarrated with Todd Haberkorn, was named one of AudioFile's best books of the year. She was accorded the same honor in 2017 from School Library Journal for her narration of To Stay Alive: Mary Ann Graves and the Tragic Journey of the Donner Party. In 2018, she was Audie Award–nominated as part of a full cast of narrators for Best Original Work, Nevertheless We Persisted, performing two pieces—one of which she authored. She is a proud member of the Audio Publishers Association, and a lifelong bookworm.